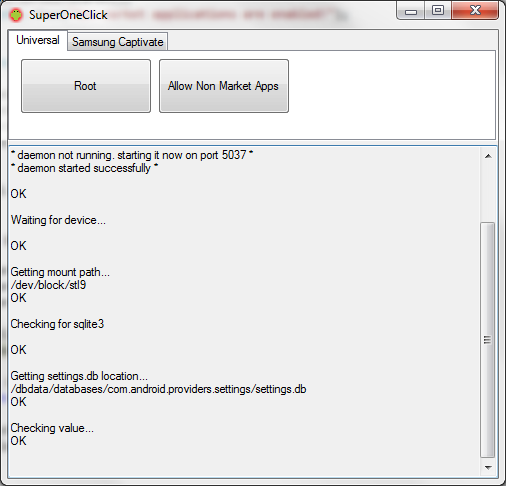 Say hello to SuperOneClick, the latest 1-click rooting method. I know what you’re thinking, “Here we go again with the 1-click root thing,” right? Before you get too down, understand that this method, while appearing to use adb commands, should work without actually having the Android SDK installed. I know from past rooting writeups, many have expressed their dislikes towards the SDK, but this should change that opinion a little. We’ve been following SuperOneClick all week and are under the impression that it isn’t all that different from the semi-1-click method we posted a few weeks back for rooting the Droid X on official 2.2. Really the only difference from an outside non-technical perspective is that anyone on Windows can run this and root very quickly without even mentioning the words “Android SDK.” (Yay! Right?) Well almost anyone. Most HTC devices including the Incredible and EVO are out of luck with this method, but don’t worry, you still have unrevoked. It should work on the Droid 1, Droid 2 and Droid X. I have not tested it myself, but I’ve used similar methods to root all of my devices. 1. Download the latest SuperOneClick.zip file to your Windows computer. Find it here. 2. Extract the files from the .zip file into a new folder on your PC. 3. Plug your phone in to your PC and turn on USB debugging. 4. Open the folder with the SuperOneClick contents and double click “SuperOneClick.exe”. 5. Allow the process to run and enjoy being rooted. Cheers to everyone who sent this in this week!